2. 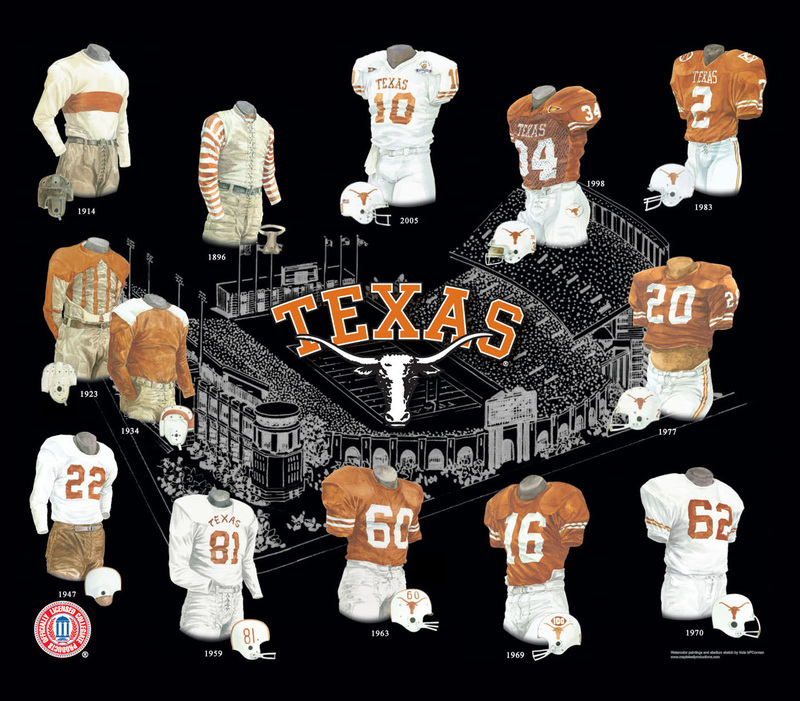 Please note that all of the actual original, one-of-a-kind artwork of the University of Texas football uniforms as seen in the poster above are actually available for sale. These watercolor paintings are truly beautiful, original watercolor paintings, and there are only 13 of them so please act quickly if you would like to buy one. 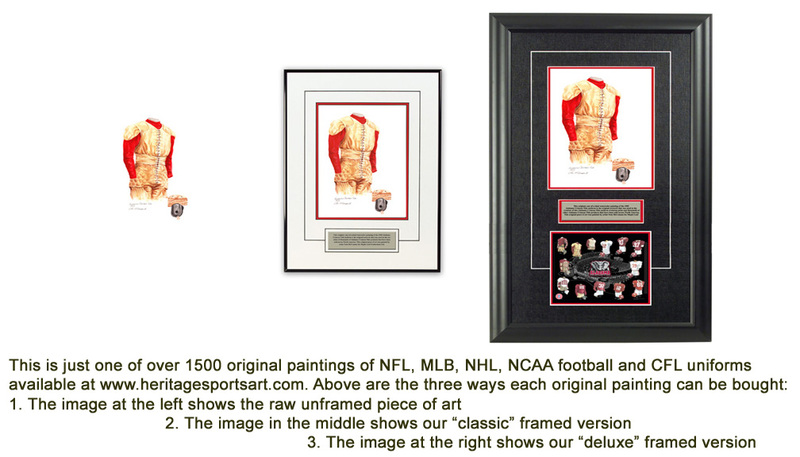 These would make a wonderfully memorable, beautiful and completely unique gift for someone who loves Texas football. 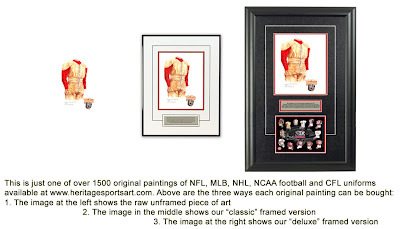 If you would like more information about this great artwork including the three ways you could purchase each piece, please visit our Texas YouTube video at www.youtube.com/watch?v=dRr3upiGUSI or go directly to the artwork website www.heritagesportsart.com/Texas-Longhorns-c93/ where you can see and purchase the artwork. The University of Texas (formally known as the University of Texas at Austin) is a doctoral/research university. Founded in 1883 and located in Austin, Texas, it is regarded as one of America’s ‘Public Ivy’ institutions of higher education - defined as providing an ‘Ivy League’ collegiate experience at a public school cost. The school started football 10 years later, in 1893. The Longhorns football team plays out of Darrell K. Royal-Texas Memorial Stadium, which was built in 1924 and seats 77,809 spectators. The University of Texas boasts an excellent tradition of football success; countless Longhorns have extended their football careers in the NFL, Arena League and the CFL. Notable Longhorns alumni include: Bobby Layne, Tommy Nobis, Jerry Sisemore, Earl Campbell, Ricky Williams and Vince Young. If Texas was nationally ranked in "The Top 20" (or Top 10 in some years) in a particular season depicted in the poster, we show the team’s ranking. That being said, prior to 1936 there was no nationally recognized poll ranking the nation’s top teams, so you will not see any rankings prior to 1936. 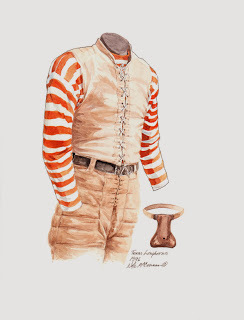 This painting honors the 1896 University of Texas football team and their 4th overall season. 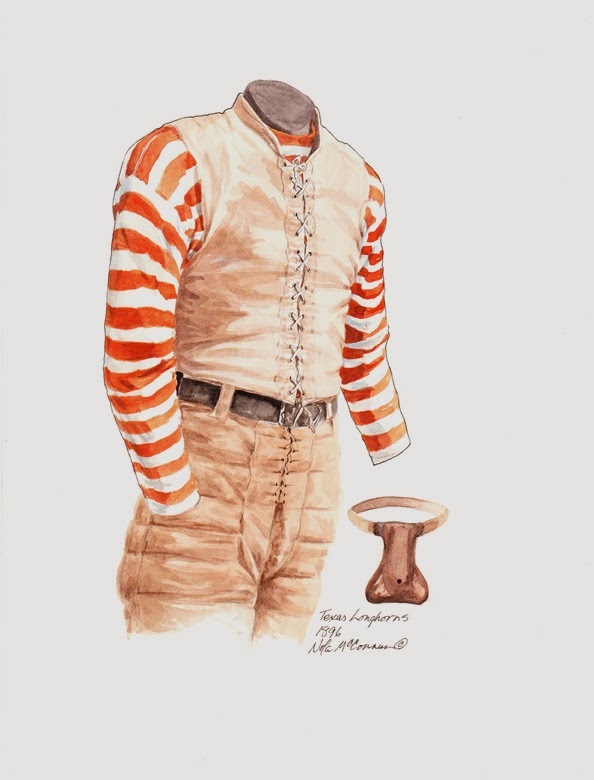 Coached by Harry Orman "Jake" Robinson, the only coach to have beaten Texas in Texas' first 3 seasons of competition (while he was coach at Missouri) and co-captained by Julius House and James Jones, the 1896 team went 4-2-1. This painting honors the 1923 University of Texas football team. Coached by E.J. Stewart and co-captained by Ed Bluestein and Lane Tynes, the 1923 team went undefeated at 8-0-1, with a memorable 16-0 victory over Vanderbilt on October 20th, 1923. 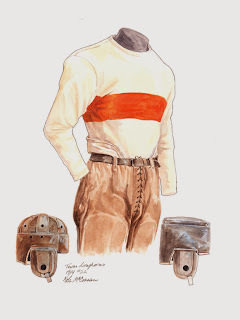 This painting honors the 1934 University of Texas football team. Coached by Jack Chevigny and co-captained by Charles Coates and "Bullet" Bohn Hilliard, the 1934 team went 7-2-1, finishing 2nd in the Southwest Conference. This painting honors the 1947 University of Texas football team and #22, worn by Robert "Bobby" Layne (who wore #41 earlier in his career). Coached by Blair Cherry and co-captained by Max Baumgardner and Raymond Jones, the 1947 team went 10-1, finishing 2nd in the Southwest Conference. Bobby Layne, also known as the "Gadabout Gladiator", was a Quarterback for the University of Texas. In the 1945 Cotton Bowl, he was involved in every point scored in a 40-27 victory against Missouri and was named to the All-Southwest Conference team 4 straight years (1944-47). He was named All-American in both 1946 and 1947 and finished 8th in Heisman Trophy balloting in 1946 and 6th in 1947. He was named the ‘Outstanding Back’ in the 1947 Sugar Bowl - with Texas’ 27-7 victory over Alabama. Following his career at the University of Texas, Bobby played for the Chicago Bears, New York Bulldogs, Detroit Lions and Pittsburgh Steelers. 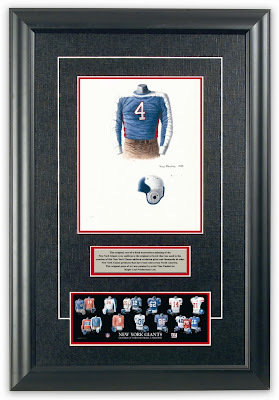 He was elected to 5 Pro Bowls during his NFL career and was enshrined in the Pro Football Hall of Fame in 1967 and the College Football Hall of Fame in 1968. He is a member of the University of Texas Longhorn Hall of Honor. He was elected to the College Football Hall of Fame in 1968. He went on to the NFL where he played for 15 terrific seasons. He was elected to the Pro Football Hall of Fame in 1967. Here is what our friends at Wikipedia have to say about Bobby Layne. 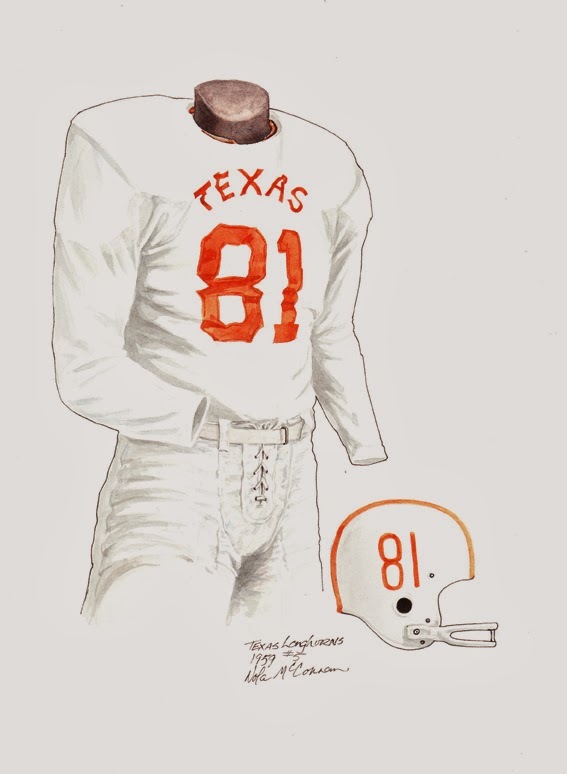 This painting honors the 1959 University of Texas football team and #81, worn by Maurice Doke. Coached by Longhorns icon Darrell Royal and co-captained by Don Allen and Monte Lee, the 1959 team went 9-2, tying for 1st in the Southwest Conference. Maurice Doke was a Guard for the University of Texas. In the 1959 season, he would not only be named All-American, but would also be one of 8 national winners of an Earl Blaik Fellowship. Along with teammates Jack Collins (Halfback), Rene Ramirez (Halfback) and Monte Lee (End), Maurice would be named to the 1959 All-Southwest Conference team. 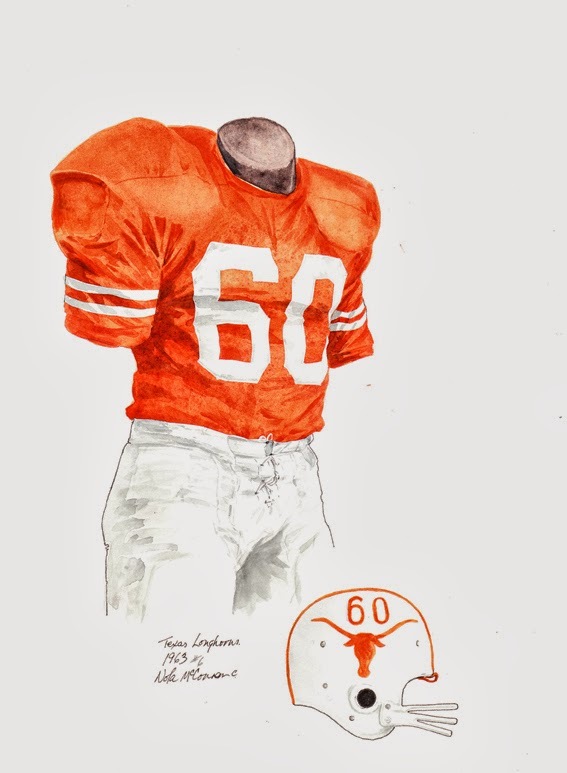 This painting honors the 1963 University of Texas football team and #60, worn by Thomas "Tommy" Nobis. 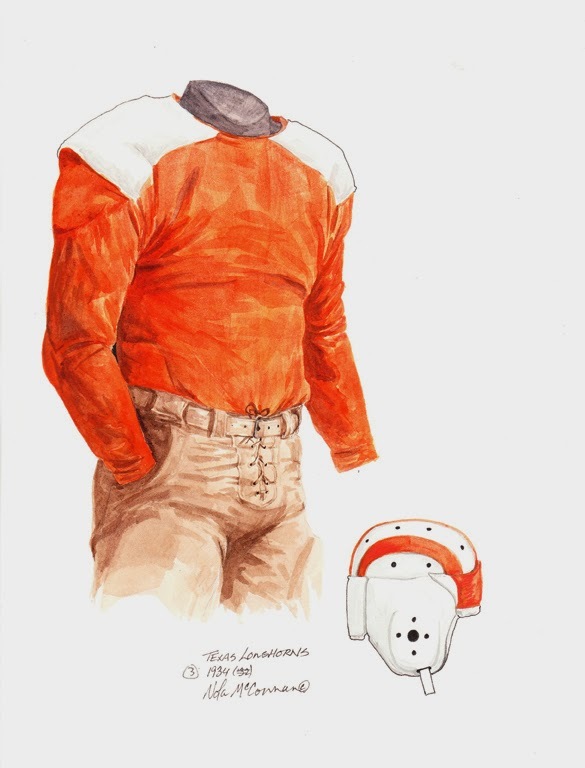 Coached by Longhorns icon Darrell Royal and tri-captained by Scott Appleton, Tommy Ford and David McWilliams, the 1963 team went an undefeated 11-0, winning the school’s first National Championship. Tommy Nobis was an ‘iron man’ football star for the University of Texas - having played Linebacker on defense and Guard on offense. In the 1963 championship season, he played an integral part in shutting down Heisman-winner Roger Staubach in the Cotton Bowl, helping Texas to a 28-6 victory over Navy. In the 1964 Orange Bowl, he was instrumental in preserving a 21-17 lead against Alabama’s offense, led by Quarterback Joe Namath. 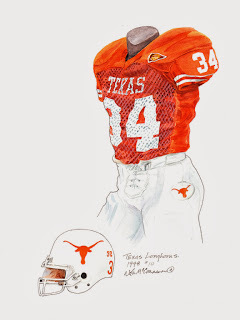 During his Longhorn career, Tommy was named All-American twice and three times to the All-Southwest Conference team. In 1965, he was the recipient of both the Outland Trophy - given to the nation’s outstanding interior Lineman and the Maxwell Award - honoring the nation’s outstanding college football player. He finished 7th in Heisman Trophy balloting that season. Following his career at the University of Texas, Tommy played his entire NFL career for the Atlanta Falcons. He was elected to the College Football Hall of Fame in 1981. He was recognized as the 14th best College Football Player of all time by the College Football News in their 2000-ish ranking. He went on to the NFL where he played for 11 seasons. Here is what our friends at Wikipedia have to say about Tommy Nobis. 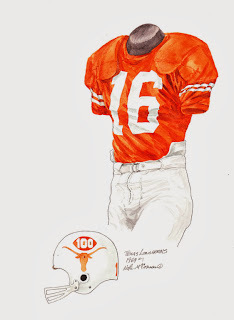 This painting honors the 1969 University of Texas football team and #16, worn by James Street. Coached by Longhorns icon Darrell Royal and tri-captained by Street, Glen Halsell and Ted Koy, the 1969 team went an undefeated 11-0, winning the school’s second National Championship. James Street was a Quarterback for the University of Texas - leading the Longhorn offense for his final two years. As a senior, he would help bring the school its second National Championship. During his Longhorn career, James was also a member of the varsity baseball team, tossing two no-hitters and leading Texas to two Southwest Conference titles. His son Huston would follow in his footsteps and would also become a member of the Texas Longhorns’ baseball team (2002-04). James Street is a member of the University of Texas Longhorn Hall of Honor. Here is what our friends at Wikipedia have to say about James Street. 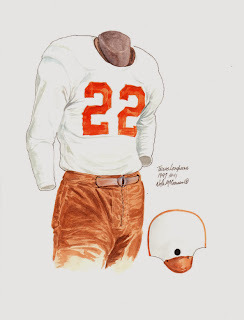 This painting honors the 1970 University of Texas football team and #62, worn by Jerry Sisemore. 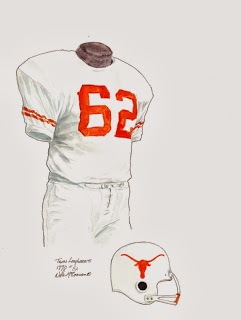 Coached by Longhorns icon Darrell Royal and co-captained by Scott Henderson, Steve Worster, Bobby Wuensch and Bill Zapalac, the 1970 team went 10-1, winning the school’s third National Championship. All-American and named to the All-Southwest Conference team. In 1972, his senior year, Jerry helped Texas win its 3rd consecutive Southwest Conference title and reach its 3rd straight Cotton Bowl appearance. Following his career at the University of Texas, Jerry played his entire NFL career for the Philadelphia Eagles - being elected to three Pro Bowls. He was elected to the College Football Hall of Fame in 2002. He was recognized as the 138th best College Football Player of all time by the College Football News in their 2000-ish ranking. He went on to the NFL where he played for 12 seasons. Here is what our friends at Wikipedia have to say about Jerry Sisemore. 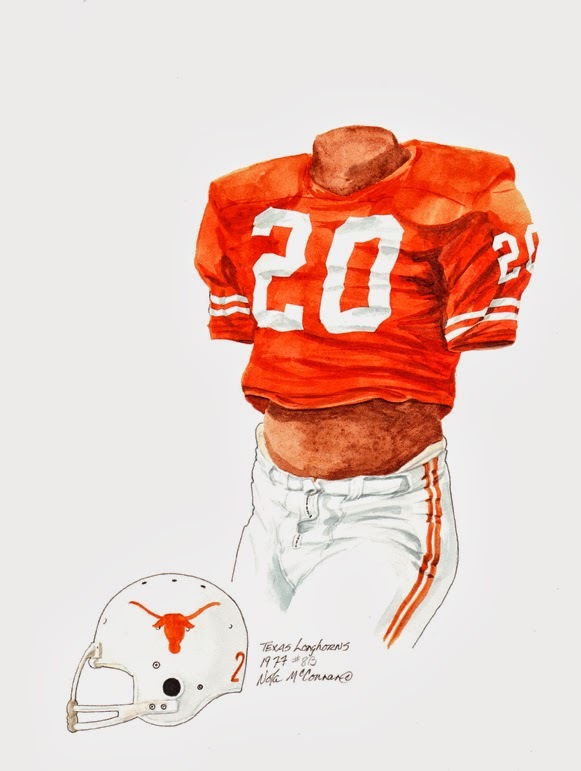 This painting honors the 1977 University of Texas football team and #20, worn by Earl Campbell. Coached by Fred Akers and co-captained by Campbell, Morgan Copeland, George James and Brad Shearer, the 1977 team went 11-1, finishing 1st in the Southwest Conference. Earl Campbell, also known as the "Tyler Rose", was a Halfback for the University of Texas. His Longhorn playing days included 21 games where he rushed for 100+ yards, three over 200 and was named All-American twice. In 1977, he not only led the nation in rushing and scoring, but also won the Heisman Trophy - awarded to the outstanding intercollegiate football player in the United States. Following his career at the University of Texas, Earl played the majority of his NFL career for the Houston Oilers, before closing it out with the New Orleans Saints. His many NFL accomplishments included 3 MVP Awards, 3 Offensive Player-of-the-Year Awards and enshrinement into the Pro Football Hall of Fame. His #20 at the University of Texas and #34 with the Oilers were both retired. He was elected to the College Football Hall of Fame in 1990. He was recognized as the 35th best College Football Player of all time by the College Football News in their 2000-ish ranking. He went on to the NFL where he played for 8 seasons. He was elected to the Pro Football Hall of Fame in 1991. Here is what our friends at Wikipedia have to say about Earl Campbell. This painting honors the 1983 University of Texas football team and #2, worn by Jerry Gray. Coached by Fred Akers and co-captained by Doug Dawson, Eric Holle, Mark Lang, Jeff Leiding, Mike Ruether and Ed Williams, the 1983 team went 11-1, finishing 1st in the Soutwest Conference. Jerry Gray was a Safety for the University of Texas - and was one of six All-American Defensive Backs to have played for the Longhorns. In an infamous 1984 game against the Auburn Tigers, Gray ran down Tailback Bo Jackson, known for his tremendous speed, and caught him from behind. The aftermath left Jackson with a separated shoulder and dashed any potential Heisman Trophy hopes that season. Following his career at the University of Texas, Jerry played for the Los Angeles Rams and Houston Oilers, before closing out his NFL career with the Tampa Bay Buccaneers. During his professional playing days, Jerry was known for being a very hard-hitter and was selected to 4 Pro Bowls - taking home MVP honors in the 1989 game, after recording 7 tackles and returning an interception 51 yards for a touchdown. Jerry has also served as a coach, as a Defensive Coordinator for the Buffalo Bills and as Secondary/Cornerbacks coach for the Washington Redskins. He went on to the NFL where he played for 9 seasons. Here is what our friends at Wikipedia have to say about Jerry Gray. This painting honors the 1998 University of Texas football team and #34, worn by Errick "Ricky" Williams. Coached by Mack Brown and co-captained by Williams, Aaron Humphrey, Wayne McGarity and Dusty Renfro, the 1998 team went 9-3. Upon completing his Longhorn career, he would hold or share 21 NCAA and 46 University of Texas all-time records including: career all-purpose yards, career 200-yard games and career yards per carry, among others. 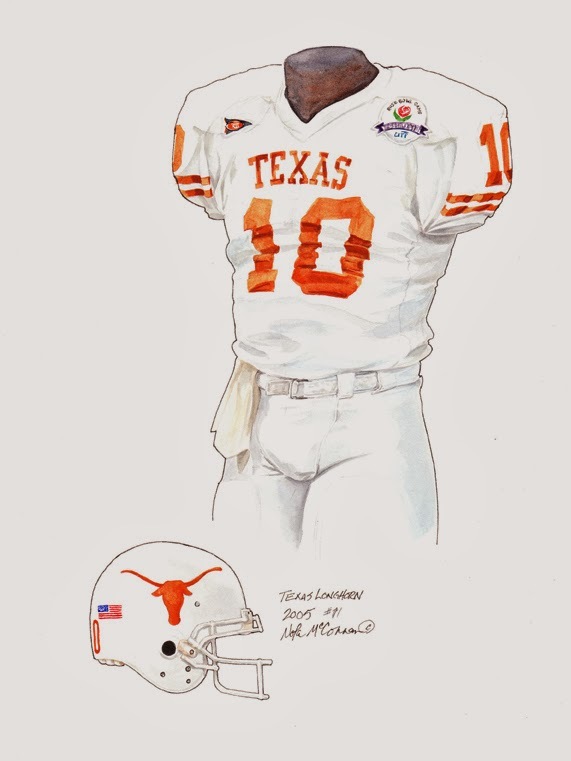 Following his career at the University of Texas, Ricky’s professional football career was severely impeded by multiple suspensions & hiatuses stemming from off-field issues. He played for the New Orleans Saints and Miami Dolphins prior to sitting out the 2004 season. He returned to the Miami Dolphins in 2005 before being forced to serve a 1-year suspension in 2006. Ricky spent that 2006 season playing with the Toronto Argonauts in the Canadian Football League. He was recognized as the 22nd best College Football Player of all time by the College Football News in their 2000-ish ranking. A summary of his NFL career can be found here. Here is what our friends at Wikipedia have to say about Ricky Williams. This painting honors the 2005 University of Texas football team and #10, worn by Vincent "Vince" Young. Coached by Mack Brown and co-captained by Young, Ahmard Hall, David Thomas and Rodrique Wright, the 2005 team went 13-0, winning the National Championship. Vince Young, also known as "VY", was a Quarterback for the University of Texas. In 2005, as a Junior, Vince was one of three finalists for the Heisman Trophy - pitted against two USC Trojans (2004 winner QB Matt Leinart and RB Reggie Bush). He would ultimately beat Leinart in the voting, but would finish second to Bush. He was, however, named the 2005 best college football player by College Football News. On January 4, 2006, in a much heralded match-up of the three 2005 Heisman finalists, Vince’s Longhorns defeated the Trojans 41-38 to win the Rose Bowl. Young’s incredible performance included: completing 75% of his passes for 267 yards, rushing for another 200 yards on 19 attempts, scoring 3 rushing touchdowns and taking home game MVP honors. Following his career at the University of Texas, Vince was drafted #3 overall by the Tennessee Titans in the 2006 draft. He was named the Offensive Rookie-of-the-Year and was selected to the Pro Bowl. Here is what our friends at Wikipedia have to say about Vince Young. 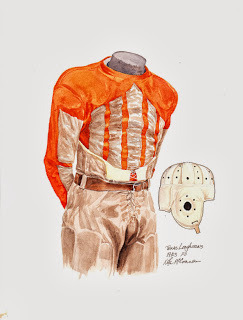 If you love the University of Texas and the history of Texas Longhorns football, you might really love to own an original piece of artwork celebrating the team's historic uniforms as seen in the poster at the top of this blog - you can actually own one of those original pieces of art! There are only 13 pieces of original art available for sale, and when these 13 are sold, that's it, they're all sold out. 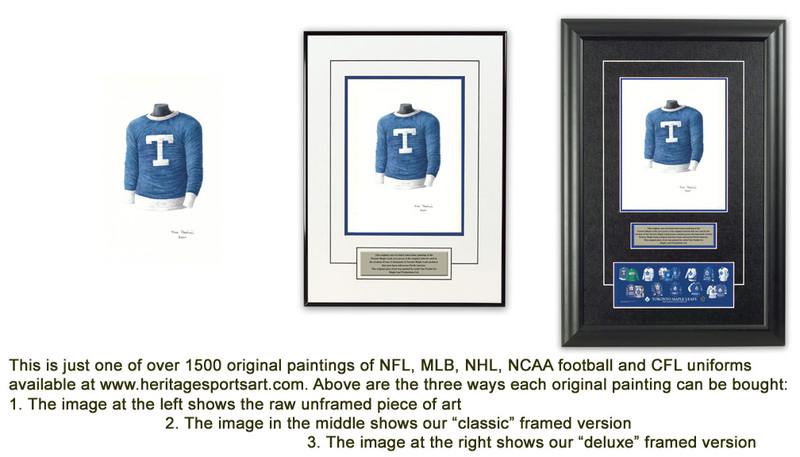 If you would like more information about this great artwork including the three ways you could purchase each piece, please visit our University of Texas YouTube video at www.youtube.com/watch?v=dRr3upiGUSI or go directly to the artwork website www.heritagesportsart.com/Texas-Longhorns-c93/ where you can see and purchase the artwork. This blog was written by Scott Sillcox and was last updated August 21, 2010. I have tried to ensure the accuracy of the information, but I am human and can make mistakes. If you believe I have made a mistake, please let me know by email at ssillcox@rogers.com ! 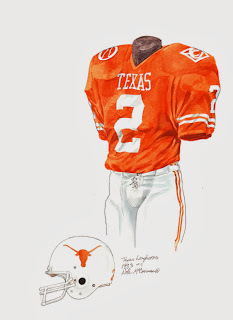 However, you overlooked the most unique Longhorn football uniform of all time. In the 1950s Coach Ed Price had the Longhorns dressed in orange helmets and orange pants, both with a white stripe. They were great looking uniforms that presented a clean look. Coach Price was ahead of his time when it came to classy looking uniforms.